Another night in New York City and Raph has passed up an opportunity to go on patrol with his (recently reunited) brothers to spend the evening busting heads with Casey. Casey wants to know what it’s like to finally have the family he never knew he had, but Raph is reluctant to talk about it. Suddenly, the pair spot a figure being chased by two punks (one with a purple Mohawk, the other in army camos). They take down the punks and rescue their prey: a female mutant arctic fox named Alopex. Alopex doesn’t remember much; just that she was taken from the wild and to a lab by several humans, who experimented on her. She escaped, but the lab dispatched several groups to reclaim her; the punks only being the latest batch. Raph isn’t interested in swapping origin stories, but is willing to take her back to the lair to meet his brothers and Splinter, who might be able to help her cope with her predicament… just so long as she goes blindfolded. Leaving Casey behind to call the police and pick up the punks, Raph takes off with Alopex. Racing across the rooftops, Raph considers Alopex’s story and how it doesn’t quite hang together; namely, the moves she was displaying while fighting off the punks were too professional-looking for a recently mutated and “innocent” fox-girl. Raph summarily hurls her off a rooftop. Alopex extends her claws and digs into the side of the building, breaking her fall, as Raph leaps down after her. 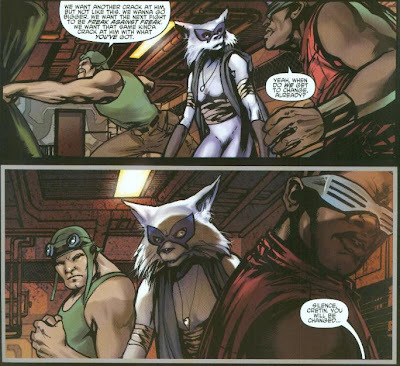 The jig being up, Alopex reveals her “true” personality as a much colder, more calculating mercenary. She had planned on tricking Raph into revealing the location of the Turtles’ lair, but with that not panning out, she exits the fight with a smoke bomb. After a while, Raph makes sure he’s no longer being followed and reconvenes with his brothers. Don checks his wounds while Mike lightens the mood with some jokes. Leo, however, immediately calculates a strategy; they will go on patrol in pairs from now on and randomize their rounds so as to make predicting their movements impossible. Raph later disobeys Leo’s orders and meets up with Casey. Apparently, even though he called the cops, the punks were hauled away by phony police officers to parts unknown. Raph tells Casey the new strategy and Casey, understanding, is ready to bid Raph farewell forever. Raph tells him to lighten up, as he’s part of their family now and he’s as deep in the drama as they are. *This story is continued from TMNT (IDW) #5. The story continues in TMNT Micro-Series: Michelangelo #1. 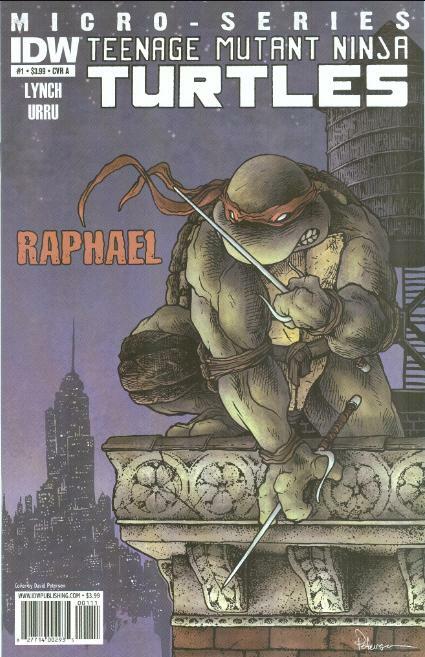 *Though it takes place after TMNT #5, it was published a month before that issue. A note from editor Bobby Curnow on the inside cover assures readers that it can be enjoyed independently of the ongoing narrative of the main series. *Raph was reunited with his brothers in TMNT (IDW) #4. *According to editor Bobby Curnow, the Foot Soldier seen at the end of the issue was not intended to be the Shredder, though his identity can be interpretted differently by readers without affecting the storyline. 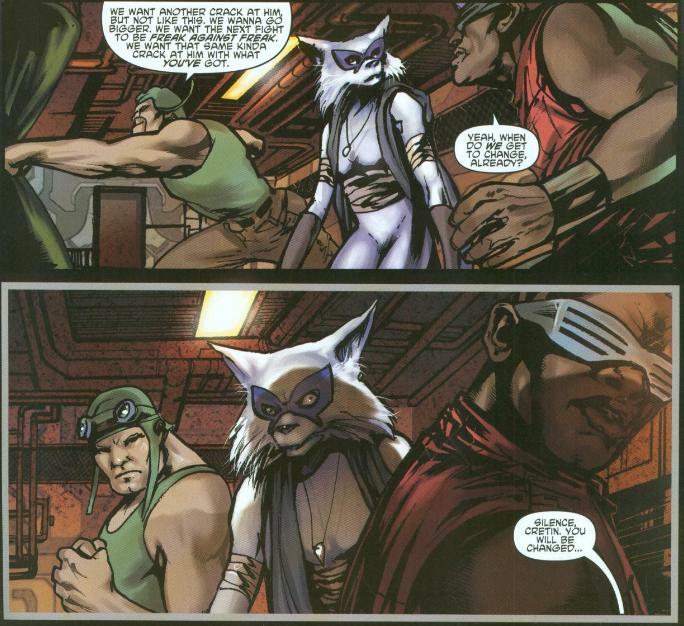 *The two thugs working for the Foot will appear again briefly in TMNT Villains Micro-Series #4: Alopex. *Following the release of the TMNT: Villains Micro-Series, later trade paperback collections rebranded this series as "TMNT: Heroes Micro-Series" for better synergy, I guess. *This issue was originally published with five variant covers: Cover A by David Peterson, Cover B by Franco Urru and Fabio Mantovani, Cover RI-A David Peterson sketch version, Cover RI-B classic Kevin Eastman Raphael (microseries) #1 version, and Jetpack Comics exclusive by Peter Laird. I’ve got a lot of words to eat, so I’d better go get some ketchup. While the pacing of the ongoing TMNT series isn’t exactly to my taste, I have been rather hard on Tom Waltz and the title for dragging its feet. However, I can see now that IDW has had this approach calculated in advance, with these narrative Microseries one-shots (and the upcoming two-part Infestation miniseries) intended to offer brisker, faster paced stories to break-up the slow burn of the ongoing. With the Microseries supplementing it, I think it’s easier to appreciate the ongoing series as it is no longer the sole source of TMNT fiction from IDW and these additional monthly titles will help move aspects of the plot forward at a swifter pace. 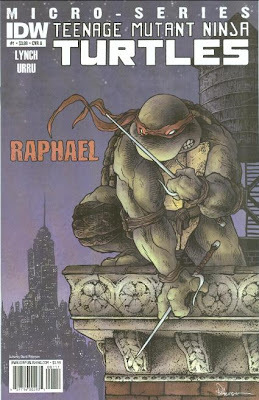 Brian Lynch pens a thoroughly satisfying tale reminiscent in ways of the original Raphael (microseries) #1; at least in so far as the spotlight follows Casey and Raph as they patrol the streets of New York and engage in running battles (I found the unaltered recycling of the classic cover as a variant to be pretty hilarious). What impressed me most about the story was that it played with my own expectations and naïveté; I just presumed that this female fox-mutant was going to immediately hook up with Raph because of my experiences reading TMNT Adventures. I scoffed at a lot of Alopex’s dialogue for sounding like clunky fangirl fanfiction; “You’re not here… to hurt me?” and “You’re the first living thing I’ve met that wasn’t trying to eat or hurt me.” Yuck. Of course, the dialogue was insipid and gag-inducing for a reason; as it was intentionally insincere. 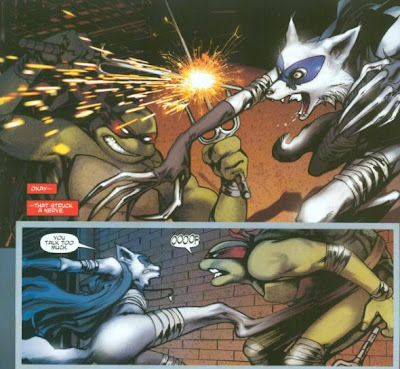 I probably should have seen Alopex’s betrayal coming, but again, I let my comfort with previous TMNT stories get the better of me; so what I thought was starting out to be a really dumb, wretched story turned out to be something very exciting. When they first appeared in the issue, I took them to be just “Easter Egg” cameos; Franco Urru using their human forms for a throwaway joke and nothing else. By the end of the story, we find out that they're genuine characters with a big future in store and duuuuude I am PSYCHED. I’ve stated before that I believe there are no bad characters, only bad writers. Bebop and Rocksteady may have had the misfortune of being annoying comedy relief villains from a children’s cartoon show, but that doesn’t mean they don’t have the potential to be re-imagined as genuine threats while still retaining their humorous and dim-witted qualities (so they still FEEL like Bebop and Rocksteady). Lynch seems to have that down in this issue, as the characters display very violent attitudes whilst otherwise being called idiots and cretins by their cohorts, illustrating they aren’t considered the smartest guys on the planet. Then, of course, you’ve got the scar-faced ninja from TMNT #2 making his comeback. It had been presumed for a while that he would turn out to be the Shredder, as the scene where rat-Splinter scars his face was reminiscent of a similar scene from “TMNT: The Movie”, but it seems he isn’t quite there yet (he refers to a “master”, so he may be reporting to a higher authority for now). I’m looking forward to seeing how he’s built up, and also looking forward to seeing how a competent and non-comedic Shredder/Oroku Saki deals with the likes of Bebop and Rocksteady. As for the idea of Alopex and there being lots of other mutants running around; I’ve never had any issues with it. Again, I’ve enjoyed Archie’s TMNT Adventures series and there were always plenty of mutant animals in that book. I didn’t feel they made the Turtles seem any less “special”. I mean, Superman doesn’t feel less “special” just because there are a bunch of other superheroes populating the DC universe, now does he? He’s still Superman. And the Turtles are still the Turtles no matter what other mutant critters show up. If anything, it makes a logical sort of sense that some villain with access to mutagen would actively create scores of powerful anthropomorphic underlings rather than stopping at one or two. And since some of my favorite characters are mutant animals, I say bring em on. Franco Urru’s art and Fabio Mantovani’s colors are gorgeous and I really, really love the visual style of this issue. Raph isn’t as expressive as Dan Duncan’s take on the designs, but there’s a superb sense of action and staging going on here. Mantovani’s colors really make the whole package, though; his is a New York City that actually glows at night and he does such an awesome job rendering the effect of bluish street lights reflecting off Raph’s skin and shell. To repeat myself, I think the pace of the ongoing is easier to take now that there’s another series to help move things along. The idea that we’ll be getting supplementing “in-between” chapters to help tide us over suits me and the hint at all the classic characters that are lined up for comebacks has me giddy. This was some good stuff. I was likewise fooled by the whole Alopex origin story and didn't immediately see the logic of Raphael's realization that the fox's kick looked "professional." It's ironic that Raphael would suspect the fox's true intentions on account of her overly advanced skills for a recently mutated lab animal. After all, aren't we readers supposed to assume that the turtles gained their "ninja" skill soon after being mutated lab animals? Perhaps this is a clue that the turtles' origin really is substantially more complex than we have been led to believe. Yeah, I quite enjoyed IDW's initial Transformers output when Simon Furman was running the show. A six issue miniseries with Spotlights moving certain plot points around and providing background on individual characters. It was a perfect formula. Then All Hail Megatron happened and ruined everything. I quit after issue #7 and haven't bought an IDW Transformers title since (and I was a guy who bought ALL Their Transformer books, even those god awful Beast Wars titles). So far, IDW seems to be doing the same thing with TMNT. Let's hope they don't lose their way in editorial like Transformers did. While I enjoyed your review, I do want to respectfully disagree with your disagreement with Mr. Laird about more mutants making turtles less special. You used Superman as an example and I have to say that yes, having other super characters around does make him feel less special than when he is among the "little" people, saving them by lifting planes and such. Hardly impressive if his friend is Wonder Woman and can survive by lifting that plane herself. It doesn't mean it's not possible tell a good story with other superheroes (or in this case other mutants), but I do think it is a DIFFERENT kind of story. As the story naturally progresses, their "specialness" can only last for so long anyway, but it is an aspect that makes them compelling characters and hopefully they don't go overboard with too many mutants too fast. Since this kind of mutation isn't actually possible (yet? ), it feels more realistic and grounded if mutations are harder to come by because we are expected that they are possible at all. anyway my rant about idw is almost as long as your issue 4 review and this is a turtles blog damn it not transformers ! Oh boy, finally: TMNT Villains Micro-Series #7 Bebop & Rocksteady. Can hardly wait till October 30. And if I'm not mistaken these will probably be the first mutations in this series where the original species is human. This almost brings tears to my eyes! I hear you, Ioannes. I wasn't so crazy about Bebop's purple sideburns originally, but they're not so bad the more you look at them. I'm really happy they're going with Rocksteady's original Playmates design, complete with the black wife-beater. I know what you mean: the sideburns freaked me out a bit too at first. I like the idea that they have hoofs instead of feet with large claws (from original sketches) or shoes that would be really uncomfortable (Rocksteady's feet seen in the season 3 episode Sky Turtles). I know, Ioannes. Heh. I don't know who came up with "have Bebop and Rocksteady party in Japan with a buffet, beer and babes as your alternative cover art" but it's brilliant. It also has wonderful fanfiction bait possibilities. As for the hoof/foot issue, I don't disagree. I like Bebop's sneakers in his original animated design and all, but, yeah, there is logistics to consider. Everyone else is happy about Rocksteady being "large and charge," vs. him and Bebop sharing the same height/weight in the 87 series. (It doesn't bother me, but I can see how it might bother others.) Finally, we have a series with proper scale. What's interesting is Bebop's shades (or their color/frame). In the Apolex one-shot, they went back to their original 1987 form, and now we're back to the Kanye West glasses but also yellow or gold (judging from the two covers). I wish IDW would make up its mind, but it's a small price to pay to have the character back, right? Hm, well you could say they're in proper scale, but then just compare all other mutants to Slash. :) Anyway, that part doesn't really matter to me either. In fact I hope they'll appear in different stuff along the way. April and Casey have many sets of clothes in this series, so why shouldn't the mutants? Alopex looks like a bobcat in this one. I'm reminded of all the weasel/hamster-looking depictions of Rocket Raccoon in marvel comics. Some artists just shouldn't be drawing animal characters.